Back in April, BofA analyst Barnaby Martin suggested that in order to mitigate the potential fallout from the end of the ECB's QE, the European Central Bank could engage in an "Operation Twist" to flatten the curve and keep term premiums low, or in other words, to avoid chaos for the European bond market. BofA: "Our economists have recently talked about the possibility of an “Operation Twist” to the ECB asset portfolio, to help keep term premiums low." Then, back in July, Reuters made it official with the first "trial balloon" that the ECB is indeed considering buying more long-dated bonds from next year as part of its bond reinvestment strategy to keep euro zone borrowing costs in check, effectively copycatting what the Fed did with its own Operation Twist first in 1961 and then again 2011, where the central bank replaced short-dated paper with longer-term debt to lower market interest rates and boost an ailing economy (which begs the question: is the European economy that ailing that the ECB is scrambling to come up with QE extensions even at a time when the Eurozone is supposedly recovering). In this particular case, the "Twist" would be aimed at limiting the natural aging of its 2.6 trillion euro bond portfolio and keeping a lid on long-term bond yields, a key determinant of borrowing costs, bu maintaining a bid for long-term debt while short-term holdings are sold. 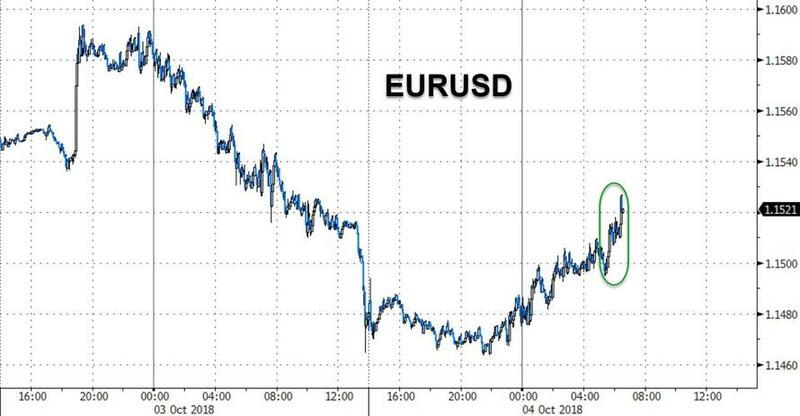 Fast forward to today when with Bund yields grinding higher into dangerous territory, Market News again reported that the ECB is considering a "Twist-like" operation. As MNI details, the ECB may stick to current capital-key shares rather than aligning QE portfolio with new shares as capital key is due for rebalancing. It also notes that a "Fed-style" Operation Twist is not being evaluated, but there could be less rigid restrictions placed on what kind of bonds to be re-purchased. What is more notable is that according to the report, ECB officials are turning increasingly bearish and see downside risks as mounting, including trade headwinds, a potential slowdown in emerging economies, Brexit and Italy’s growing budget deficit. That this is coming with less than 3 months left under the ECB's QE mandate is especially troubling. To address this, the ECB's enhanced guidance should give an indication of ECB thinking as to how it could respond to events over a one to two-year horizon, MNI notes. In kneejerk response to the MNI report, bund futures promptly trimmed declines, with the 10Y yield dropping to session lows below 0.51%, while Germany 5s30s curve flattened 2bps to the narrowest in almost 2 years. The news also helped the euro hold above a key pivot area, with the EURUSD matching earlier gains in the pound after European Council President Donald Tusk said the EU is serious about getting a Brexit deal, though he rebuked U.K. Foreign Secretary Jeremy Hunt for likening the EU to the Soviet Union. Whether this renewed attempt to flatten the yield curve and push long-dated yields lower will succeed will ultimately depend on what happens with US Treasurys, where - for now at least - the furious selloff of the past 24 hours appears to have stabilized for the time being.